But… what/where is CT system? some indicators/rules? Money Management rules: SL set at Kinjun-sen for all systems except original which uses Kumo cloud +2- pips. Trade management: Original system: exit trade when trend reverses, KS, CT systems, use TS at size of SL or 200 pips, whichever is smaller. Real Money system uses manual TS set at KS when new low is hit that day. CTPP system uses TS of 100 pips when profit= 100+ pips. [B]KS system:[/B] Went short EUR/JPY, AUD/USD long, AUD/JPY long and GBP/JPY long all hit SL. Well, I don’t know what I’m doing wrong, I am following each system’s rules to the letter and hoping that patience and persistence pays off. Note: Given the fact that there are traders on these forums who use the Ichimoku for position trading and make money doing it, I must assume that this run of very bad luck is normal and inevitable. So I will press on and continue running each system based on its rules and hope that in the long run they prove profitable. Not necessarily, it depends on your entry rules I guess. …been reading your results with interest. I don’t use ichi in quite the same way as you for all entry rules by the way, it’s more of a guide for me but I did have success in the past using the system over at forex factory but I never went lower than the 30min timeframe. First let me apologize for not posting an update yesterday, when a bunch of trades where made, I was 80% done with it and Safari crashed on me. It was late so I decided to roll yesterday’s activity into today’s update. [B]Original System:[/B] From tuesday night, USD/CAD short, AUD/JPY and NZD/JPY longs hit SL. what are you entry signals? Got some chart examples? I think you must be doing something quite different from the convectional. This is another great system, one which fits in best with candlesticks with no other indicator necessary. 4Hr min timeframe, best on 1D. Set it up, change visualization to 4hr and above checkboxes, flic thru the timeframes as you trade. I suggest you re-read the IchiWiki (very short) thing - then do a few scrolls backtesting and you're set. Someone asked for a visual aid for the complexity, I have the simplest. Draw a line, of the trendline tribe in MT4 platform, and then doubleclick it. Three markings appear on it. Stretch it horizontally in the way shown in attached pics such that the left mark lies on a chikouspan extreme, and the middle on a candle close. Everyone loves GBP/JPY? Hope to see marked improvement, hunt on. I would like to post examples of the system I would trade Ichimoku, all emotion and intuition detatched. On any chart, I would first plot the Elliot wave pattern and place all s+r of visible reversals and kinks on MN1 timeframe. Then I wld do the same for the 1D and 4H. I never go below 4H because it entails more work and stress per second, no time for forums - I’ld make crazenpips, then loose them all back in one trade. I copy free EW analysis off a fabulous site I aint about to mention here, it isnt my analysis. I learn price action and money mgt from the ol’folks in these forums. And I dont use other indicators (xcept for volumes for London Breakout and Rush, and fibo) because they cloud the eyes - really. Ichi isn’t an indicator? The market cycle will ever be, and the wave is ever tradeable, if only one sharpens a statistical edge by being consistent in one of the many proven methods. 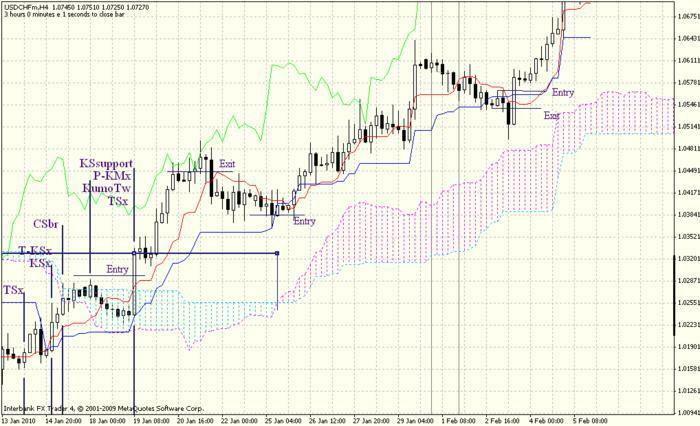 Set up Ichimoku such that visualization (MT4) is for 4H and 1D frames only. Now we should do only 1D with Ichi, but we want to see price shifting, so we prefer 4H, which still displays the same fundamentals a higher 1D frame w’ld. To start off your daily analysis, scroll through higher timeframes to get a general outlook then zoom in to 4H, and set “If…then…” criteria for each pair both up and down depending on daily range and s+r and current wave structure. I use the borrowed larger- wave count to count waves of small degrees which enables me to name a closely accurate sequence most of the time which I cant get anywhere else – nothing special about it. With that, I’ld be waiting for specific trades as they come. Most will fake me out, but statistically, I gain an edge by letting winners ride for long. The primary sequence of entry signals is as most people would place them - KumoBreak, T-Ks Cross, KumoTwist, and Kumo Gradient, as put in post #162 (I didn’t get the systems though). Other confirmation to watch for include ChinkouSpan break across price 26 periods back. To exit would mean either TProfit being hit, or them signals reversing. I have thrown in a picture to illustrate current entries. Entry: Max.Risk = 4% BankAcc., SL = 70p - 140p max, BreakEven = 2(Risk) or 2(SL). Exit: TP =3®, alternatively book some profit by moving SL to = 2® and disable TP and trail SL at = R to try and max on additional wave movement. This is where I attach charts showing me chippinpips off the market like ‘the Dragon Warrior of the Jade sword’, but that won’t be in order since its in the movies. I’ld rather post progressive charts continuously? That way still, I will show only pip gains / losses and how they affect my account in proportion. I have attached pictures of my current trades. The e$ chart shows two open short trades: one entered at Entry a e$ = 1.3880, SL = 80p behind blue Ks line, now up 155p, manually trailing SL at = -80p; and a smaller second position entered 12hrs later at Eb e$ = 1.3820, SL = -80p behind Ks, now up 100p, figured to place SL equal to the other, SL = BE . The $cad chart shows one long at =1.0660, SL = -70p well behind KS at = -30p, now up 80p, SL = BE, cldn’t resist moving it during 1600 rush. I haven’t placed TP as yet. There would’ve been other open positions on gy which hit trailing SL = -100p of peak price, and ey which got stopped out 30min into the deals. Noob here. First of all a big thank you to this site and its contributors. This is my #1 resource for Forex learning. I have some noobish questions concerning this method. I don’t understand condition 2. The Chikou seems to always follow the price line, how can we know if it goes over or under it? I just cannot see it happening… There must be something I don’t understand. Same thing for tracing support and resistance levels (and consequently stop loss and take profit level). I don’t know how I can determine the exact price. While waiting I’ll continue reading and learning. 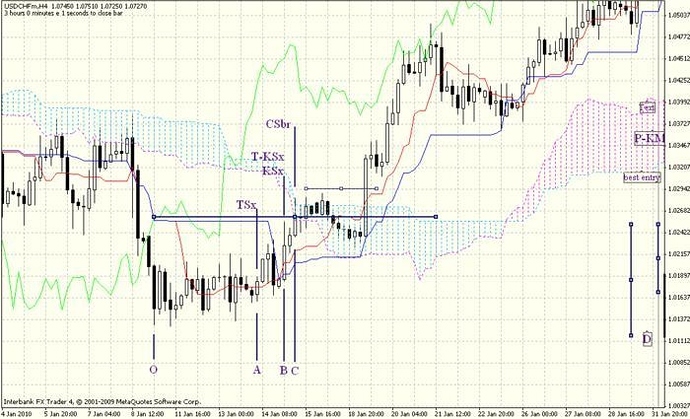 By the way, even if I don’t understand it, I tried this system and got 33 pips really easy. E$ hit manual trailing SL to bank +155p for the trade entered at Ea, and +100p for the second Eb position. The $cad entered at 1.0660 was stopped out slightly above the TS at 1.0710, bagging 50p. No open position this weekend. The Chinkou-span is time shifted 26 periods back from current price – as trend changes, it crosses above the price that was 26 periods back. It isn’t a good excuse to enter by itself, buy rather confirms the other signals. Starting at point O, assuming we don’t know where price goes next. At A, the first signal, price crosses KijunS, at B price crosses KijunS, TenkanS crosses above KijunS, and Chinkou S breaks above price 26 periods back at C. At D, KijunS supports price, price truly crosses Kumo, and Kumo twists – the excuse to enter doesn’t get better than this, but in real life, these are quite elusive, and you either miss it altogether and enter late, or get in, realize it’s the fakeout six candles back, exit at a loss and swear not to do it again. Maybe the trick is consistency. One may evolve a method to get in smaller positions every time price is supported by either KS, TS or Kumo… With a method like SL = 70p, Risk = 2%, TP = 2times SL, the fakeout wouldn’t ve stopped you out, and you would’ve exited on every drawback and gotten in again on the continuation. For SL = 140, R = 2%, TP = 3(SL), at 2(SL) disable TP move SL to BE, trail SL = -100p; then one would ve stayed in all the way with less work, but less profit per move. Another way is to always keep the SL below a line, like below TS, or better, KS, at all times. Such settings are gotten by backtesting, and coining the best settings to catch the moves you’ld want. Throw in ElliotWave and S+R and PA and you’ve got a real sharp edge. I have attached a link to Phils Candlesticks forum, you might want to stay up overnight on that. In his book he mentions money mgt, and expounds well on PA and S+Rs - made me switch off all indicators months ago, and I’m still here. You should also do the whole school on this site, then re-read the pre-school math for basics on money mgt. Don’t ever leave this forums and you re set. I had meant to post some query about money mgt math in the other thread – there is a disparity between my calculated figures and my account figures by one decimal place – but my posting rights in that forum lapsed, guess it’s something I said. I think it would be in context here since some people here have similar or so problems. Given a $250 bank acc, and a trading strategy like SL = 70p, R = 2%bank, TP = 3R. To find the optimum lot size to trade the strategy. (i) . Find how change in price on chart will affect account. For all other currency pairs, 1pip value will appx. 0.0001 dollar terms. (iii) . We can then calc 1p,2,3,4,5p,10p, 25,20,25,30,35,40,45,50p, 60,70,80,90,100p, 200,300,400,500,…1000p; and also each pip change by different position sizes like micro – 0.01,.02,.03,…05, mini – 0.1,.2,.3,…5, mini – 1,2,3,…10. We will then arrange everything on a table, that way we’ll never have to calc it again. Here, I have attached the table in pdf. (iv) . Now, I calc figures for my acc size. 2% of $250 comes to $5. I want that to be my risk ® in the trade. From the table, we can even shade a diagonal boundary of max pip change per lot size in $, and thus max optimum lot size for every intended trade, that fall within R = 2% limit. Not as many as for a bigger account. For SL = 70p, it would limit the options further to only those lot sizes whose 70p move wont exceed $5. For SL = 20p!, not withstanding that it would get triggered more than would allow for any edge whatsoever, we would be able to place heavier lots and still meet R = 3%, thus loose bigger per pip move – someone ought to note that. This is not a “get rich quick” thing, thus TP is usually equal to 12 – 15% or so of the account in bliss weather. Not 70%. And that method for kinda estimating optimum size just wont cut it for long, however anyone does it, but only by knowing it first. (v) . Last week I figured out something about margin, and I had to laugh. But I still can’t figure why the calculated values don’t correspond with what is on my trading platform history. And its not my broker, its my math. Like now? for the past E$ position, a 0.01 position on platform was raking what a 0.1 on the table shows for every move, also for yen pairs. Could someone figure where the decimal place goes? My outlooks for this week are as follows. This is not a lets-all-jump-off-the-cliff post – it’s intended to show or test analysis based on IKH by another uncertain trader, and may thus be highly subjective and off the mark. Much of the EW analysis isn’t mine. Eur/Usd: strong bearish continuation towards 120’s for © wave past (A) point, but maybe delayed by consolidation towards D1 timeframe TenSen to 1.3800 maximum. Long-1.3720 on London break/rush volume ONLY; TP=100p; SL=50p; R=2%;…low probab. 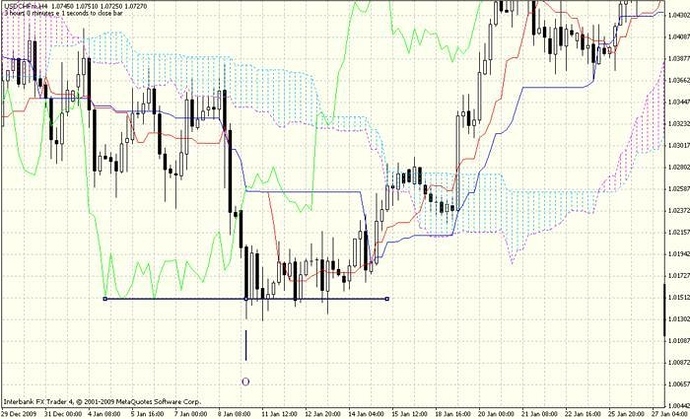 Short stop – 1.3610, 1.3600,1.35950; SL=70p;140p max. ; R=4%; BE=2R; TP=open. Eur/Yen: Setting up for a turning point, bullish after turn, sideways last consolidation and wave 1 & 2 complexes expected. Distance from KijSen affirms this. Price close below last week downward extreme will delay rally further. Earliest Longstop-122.50, 123.00; SL=50p; TP=100p, at 124.00, at cloud H4 frame or open to KijSen D1; R=4%; BE=50p or ASAP. Or wait for close above Kumo. $/Cad: Outlook is strong continuation of bullish, just broke above cloud then supported, all other signals check, wave iii thus long ride next. Beware initial correction in nearest future. Longstop-hit-1.0720, 1.0770; SL=50p,70p,140p max; TP= 80p min, 140p, or open; BE= at 70p. Gbp/Usd: Gone far from TenSen D1, retracement maybe at hand, but very short term limited to 1.58 supported by most analysis. Longer term bearish after consolidation, or immediate if last week extreme low is breached. Long-1.5645 or there about; SL=50p; R = 2%; TP=100p at 1.5760 or best, only on London break/rush volume if correction starts, or stand back altogether. Shortstop-1.5520, 1.5500; SL = 70p, 140pmax; R = 4%. Gbp/Jpy: Strong argument for near-term correction of last move towards 141.70, 142, 142.50 TenSen on D1, KijSen H4, Longer term continuation of bearish move. Long-140.00; TP=141.20, 140p; SL=70p; R=4%. Short-139.00; TP=openish, SL=140p, R=4%. For retracements, look for TSen cross. Do not move SL to BE too early or before end of active sessions (London Break & Rush). If volume increases with price facing against a trade during these sessions, disable the order or close position. At Tue07xxGMT, triggered trades are g/y at +4p, e/y at +32p, e/$ at +15p. The Cad pair had to close down early since all others are gaining while it is loosing, and it was a 4% higher risk trade. Am not at home so can’t post what pairs i traded, but i did trade this system on the daily time frame, and word for word on entries as dictated by the rules. Does this system work with any time frame ? Is it still OK to enter a few candles after all the conditions have been met ? This is the greatest concern as I do not have the time to sit in front of the monitor 24/5 to wait for all the conditions to be met. I tried to answer s0me questions 6posts earlier at junglepost #172 on this page? The Ichimoku Kinkyo Hyo is best on 1D, and H4 because somehow there is not distortive change between the two? But all other timeframes is useless in the longer-run. Set indicator visualization (MT4) such that it is visible on these two timeframes only. What I think I didn’t explain clearly is the part for the visual aid. On MT4, click the draw-trendline button (I wish I could take shots of desktop?) and stretch a short horizontal line from any ChikouSpan extreme, across price at corresponding point horizontally up to somewhere beyond above/on/below the Kloud. Double-click on the line to highlight it. Three points>balance your line to fit left point on ChiSpan, mid point on price close of bar>right is exactly above/on/below corresponding Kumo cloud on right. Grip midpoint, move line along price such that line is always horizontal and midpoint is always on candle bar close – look at price don’t look back while shifting. Youll see THAT and many other points on the IKH. Please read IchiWiki very short-google it. See earlier post for attachments. 1100GMT. Current trades still open as was, watching for the direction that will establish on 1200GMT ‘London Rush’ / ‘New York’ (pre-) open, and adjust accordingly if to minimize losses, or to prevent premature stoploss. Here, I zoom in on 1H, press ctrl-y and setup volumes indicator to see the next wave. 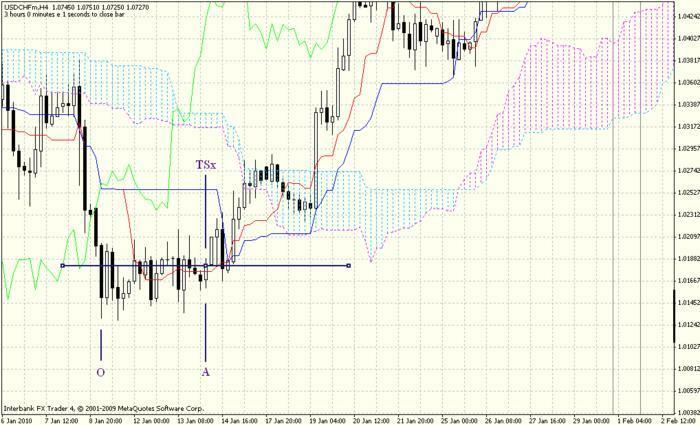 The Ichimoku Kinkyo Hyo is best on 1D, and H4 because somehow there is not distortive change between the two?